Do you love broccoli but you’re out of ideas of cooking it? well, look no more, this crustless broccoli and onion quiche is perfect. Serve this quiche for Sunday brunch, and enjoy high-quality protein from the eggs and egg … I also sauteed the onions and broccoli a bit longer than it called for. 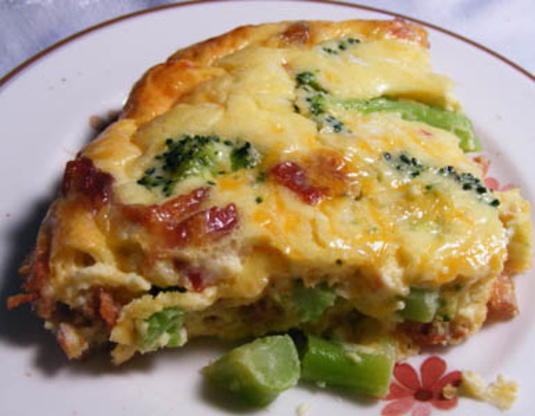 This crust-less quiche clocks in at only around 200 calories and is a great source of protein. Preheat the oven to 350°F. Lightly oil a 9-inch square baking dish and set aside. In a large skillet, heat oil over medium heat. Add onion and cook, stirring frequently, until softened, about three minutes. Add broccoli and cook about five minutes or until just tender. Transfer vegetables to prepared pan. In a large bowl, beat together eggs, milk, Romano cheese, salt, pepper and oregano. Whisk in rice flour. Pour egg mixture evenly over vegetables. Sprinkle with paprika and bake until set, about 35 minutes. Cool quiche 10 minutes before serving.